My first retexture job in Photoshop. This is simply a reskin of the standard steel armor that comes with the game, plus a female cuirass. It has the same stats, and costs the same. The only difference is the color. There is no shield included, as I couldn't get the shield to look right. 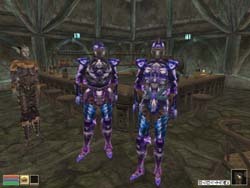 You can buy this armor from an NPC I placed in the Hlaalu Plaza in Vivec. You can also attempt to steal it from her or kill her for the suit she's wearing, but she's level 50 and has a daedric weapon, so be very careful. Current Version: 1.0 Requires BETTER BODIES v2.0! 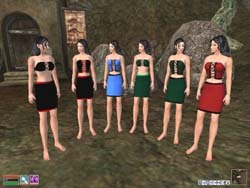 Adds six new retextured dresses for female characters, all based on Neuman's tight-fitting dress mesh. These dresses all use the groin slot, and thus are compatible with stock boots. Requires Better Bodies v2.0. Will not display correctly with original bodies; not tested with Smoother Bodies or Maborishi's Natural Skins. Current Version: 1.0 Requires BETTER BODIES v2.0 or higher! Adds 5 new sets of female-only armor to the game, designed for use with Better Bodies. You can buy them from a merchant NPC in the Ald Skar Inn. Requires Better Bodies v2.0 or later. Will not display correctly with original bodies or other body mods.